Income Tax Return (ITR) acknowledgement forms or documents related to refunds and others are sent by Tax Payers to the I-T department’s CPC in Bengaluru can now send it to a unique pin code. 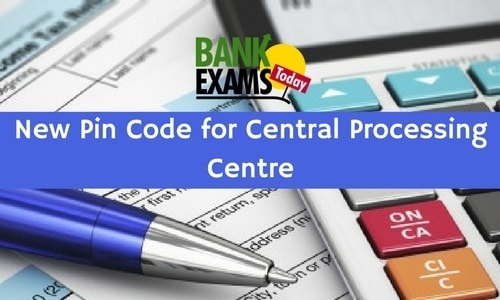 The Department of Post has allotted the pin code to the Central Processing Centre (CPC) to ensure that letters and mails sent by taxpayers are not lost and reach the Centre without delay. CPC is a database center for receiving all Income Tax Returns (ITRs) both e-filed and sent through post and processes them for issuance of refunds and also deals with other tax related documents of a taxpayer. The new pin code is 560500 while the CPC earlier used old pin code is 560100. The Finance Act, 2008 empowered the Central Board of Direct Taxes to make a scheme for centralized processing of returns with a view to expeditiously determining the tax payable by, or the refund. Based on the recommendations of the Technical Advisory Group, the strategy adopted was that Centralized Processing Centre (CPC) at Bangalore would process paper and e-returns without any interface with taxpayers in a jurisdiction free manner using a partially outsourced model through a Service Provider. The specified objectives of the CPC Project are: To develop and implement a comprehensive system to increase efficiency, and effectiveness of ITD(Income Tax Department) in processing, accounting and reconciliation of the returns filed to set-up a central processing centre and achieve back office automation on an outsourced model for performing the non-core activities of ITD to manage routine tax administration functions such as receipt, scanning, data entry, processing, issue of refunds and storage of IT returns in a centralised manner. The new Financial Accounting system was conceived and designed as double entry accounting system. This system is not prevalent on Government departments and has been a path breaking innovation. This system ensures auto reconciliation between various accounts which is of immense help in enhancing compliance capabilities of the Department. New computer friendly IT Return Forms were designed which assisted in use of digitization technology solutions. In the selection of Business Model for CPC, a comprehensive market study was conducted to list down available options. The choice was between Procurement model and MSP (Managed Service Provider) model. Keeping in view the past experience of SI projects (for setting-up data Centres), MSP model was adopted with all strategic controls with ITD. TDS Mismatch has been one of the most important stumbling blocks in automation of processing task. To cleanse TDS database and to increase its correctness and completeness, several measures were undertaken. There are 14 services that have been implemented as part of the CPC solution which cover the functional domains of logistics, scanning and data entry, tax processing, tax accounting and data extraction, validation and reconciliation. The business processes components involved are Logistics, scanning, data entry, Tax accounting, interface with legacy systems, processing of returns, refunds, printing & despatch, dedicated on-site hi-tech post office, record management, call centre and advanced customer support. CPC had reduced the processing time of IT returns considerably. Income Tax Return is a proof that you have paid your income tax. It contains details about a person’s annual income and the amount of tax paid. Every year Indian citizens who earn taxable income have to file Income Tax Return (ITR). ITR will help you in get refund in case you paid more tax than what you are supposed to pay. If you fail to file your ITR you might have to pay penalty or face legal consequences. Return of income is a form which lists the particulars of income and tax paid by an individual, firm or organization in a financial year. This in turn can be presented to the Income Tax Department. There are different forms for incomes of different status and nature and they are readily available on the online portal of the Income Tax Department of India. Currently there are nine different forms available for filing of income tax returns. They go from ITR-1 to ITR-7 and also include the ITR-4S and ITR-V.
ITR-1- Deals with income of an individual with salary or pension or income from one house property or other sources. ITR-2- Applicable for individuals or Hindu Undivided Families having any income other than profits and gains of business. ITR-3- Applicable for individuals or Hindu Undivided Families having income sources from profits and gains of business. ITR-5- For entities being a firm, LLP, AOP, BOI, artificial juridical person, co-operative society and local authority. This does not include trusts, political parties, institutions, colleges or entities that are required to file the return of income. ITR-6- Applicable to companies other than the ones which claim a deduction. ITR-7- Applicable to all entities who should furnish a return of income. ITR-V- The acknowledgement form of filing a return of income. There used to be grievances where taxpayers complained that they have sent their ITR-V acknowledgement for ITR filing through post to the CPC but it did not reach the Centre. So to get the complaints and resolve easily the new unique code has been given. The new pin code is exclusively meant to help CPC of the Income Tax department and it will now help to curb the complaints and issues of non-reaching of postal mails. Officially taxpayers can address their mails to “Central Processing Centre, Income Tax Department, Bengaluru, 560500” for the purpose of submission of ITR-V forms and other documents which require physical mode of transmission. These are the important thing about CPC in Bengaluru which has a new pin code as 560500.